Someone hid a golf ball under my clavicle – or at least it felt like that. This muscle knot reached epic proportions and caused me to gasp when I moved in my chair. The radiated muscle pull reached round my rib cage and had me, at one stage, peering around restaurants to see if they had a defibrillator. In Australia my doctor would prescribe pain killers and stretches. After a time the pain killers became mind numbing, and stretches helped but never provided relief. Last Saturday I presented myself as a patient to Wong Tsz-ming on Hennessy Road in Wanchai. His waiting room was much like any doctors, except behind the counter nurses were preparing combinations of powdered medicines. These were measured into a mixer that then dispensed and sealed small sachets. In my consultation Doctor Wong explained the five core energy sectors that guide our health. He took my pulse and blood pressure. He explained my energy that surrounded me all day and helped me through the day had nowhere to rest at night. My stomach was too cold. To slowly melt the cold I needed to abandon coffee, and switch to red tea – like English Breakfast. Adding honey and lemon were good antioxidants, unlike coffee which was an oxidizer. After I was led to a long room cut into small cubicles by a series of curtains. There I was told to disrobe and lay stomach down. The first treatment was meant to relax the nervous system. This consisted of a small stick with a tiny nail at the end that the doctor gently whacked across my shoulder blades then down my spine – and at the back of my knees. I felt relief when he stopped. The next treatment was cupping. 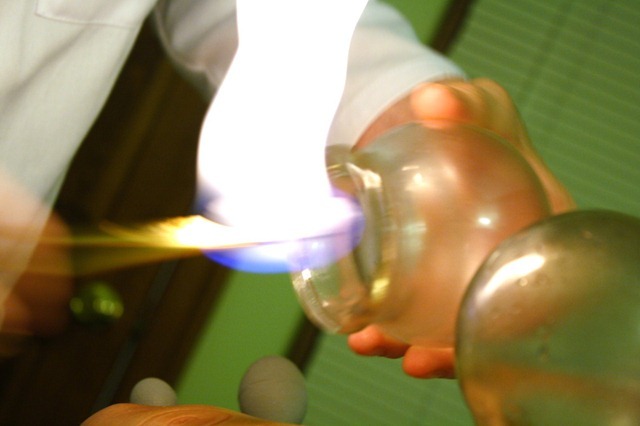 In cupping, small yet heavy glass globes are heated quickly with an open flame. These are then placed on the back at core points where the heat inside the globe causes a vacuum with the skin then pulls in the top layer of skin. This is meant to pull the blood to the surface and cause movement in critical areas. These are left for 8-10 minutes with blankets over top. You’re meant to relax which was marginally possible until the doctor applied a cup to the back of each knee. Words fail to describe the sensation. The downside of cupping is you are left with a series of bruises where the cups were placed. The photo below is NOT of me but is the least disturbing you find when Google searching “cupping back bruise”. After the cups were removed the next treatment was acupuncture. Thin needles were inserted into critical points in my body. The first was the fleshy part between my thumb and pointer finger. The next were my ankles. Then over a few minutes needles were inserted where my neck meets my skull, all down my spine, into my shoulders and – as expected – into the centre of the back spasm. He finished with one in the back of each knee. A warming lamp was placed over my back and I was left to relax for 10-12 minutes. Needless to say I didn’t “sail away” but I was able to forget the needles momentarily. Any movement provided a not-so-gentle reminder. Later the needles were removed and I had my third treatment. The doctor had me move into various positions on the table then he man-handled me during adjustments. This was closest to a chiropractor session. At the end I was told to dress. At the nurse’s station I was given a small back filled with sachets of medicine. I have to dissolve two in hot water and drink these after breakfast and dinner for a week. The first two nights led to unrest and wild dreams. I cut back to breakfast and late afternoon. It’s amazing that I would read the product insert before taking any pharmaceuticals, yet ingest Chinese medicine without any knowledge of what it contains. Because it is made of natural ingredients my false assumption is it’s good for you. Yet many natural ingredients pack a punch. Willow bark contains acetylsalicylic acid – the active ingredient of aspirin. In Northern Burma at a traditional market I bought a block of willow bark and was told to peel it away and smell whenever I had a headache. Oleander can be fatal. Yet here I am faithfully taking the medicine – and avoiding coffee altogether. The upside is the pain dissipated immediately and all but disappeared after a day or two. Last night I returned for the same series of treatments. Today my back pain is marginally present yet it feels more like a shadow where pain used to be. I will continue my investigations and can recommend to others that a trial may prove the treatment you need. Be adventurous. And if I can provide one great piece of advice – bring your iPod. Music makes the time pass quicker!